I am so glad that Flattenme.com confirmed my opportunity to work on a product review to their prestige merchandise. I am so excited to try a customized shirt as well as a water bottle for my 3 years old. I have never tried on purchasing a customized item before for I am afraid it won’t turn out good. 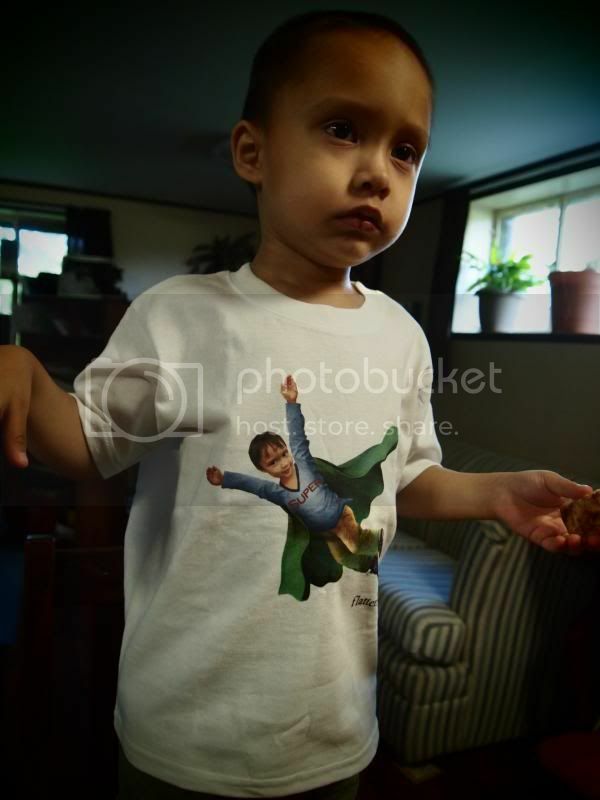 I choose the T-shirt with a design of a Super Kid for my son. I have to ensure that I got the right size, which is 4T. You also need to fill out the gender to determine if the shirt belongs to a boy or girl. The shirt has a retail price of $27.95 online. If you order for boy and girls, ages 2-16 years old please allow 1.5 – 2 weeks for delivery of your custom shirts. My son looks pretty tired here...I wonder why? 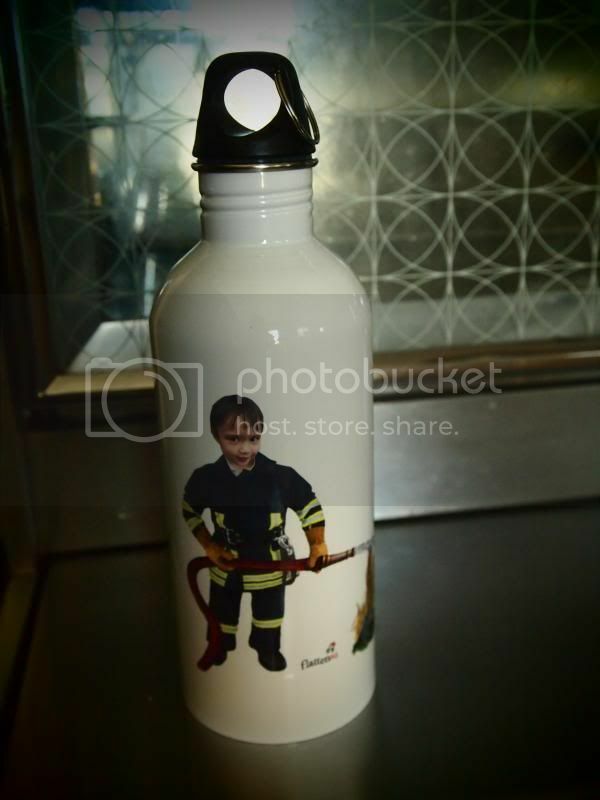 I also got the water bottle for my son, which has the firefighter design on it. This would encourage my son to be more hydrate this summer. Because he sees his face on the bottle, he will surely is proud of having his face on it. I have to double check that the photo I have for my son was when it shows his whole face front. It is better to check and read the details in order to have a better outcome. When my son saw the customized items, the happiness on his face is priceless. I wish I had taken a video hence, I didn’t imagine how happy he was. He couldn’t believe that it was his face on the water bottle as well as on the T-shirt. The quality of the T-shirt is good. I see a nice fabric, as for the water bottle ensures to follow the care instructions in order to have a safety use. If you wish to purchase and customized your items with FlattenMe.com please visit the website @ http://www.flattenme.com. You may use the 15% off discount FlattenMe.com offers to my readers, the offers only apply to ABC Books, T-shirt and water bottle. The code is valid between now until September 15, 2013. Simply add Back2School_15 code at the checkout. What are you waiting for? Take advantage of the opportunity now! This can also be a great gift for your kids, they also carry other products online such as Cards, Books, T-shirts, Journals, Kids Gear and Wall Arts that you can customize too. They can also be reached through Facebook and see more of the good stuffs they have. Flatten sponsored the giveaway and would like to give one of my lucky winner a personalize T-shirt or water bottle a value of $27.95. However, the winner is responsible for paying the shipping cost, which is $3.99 – US [$9.10 Canada]. Open to Canadian residents and US only. Giveaway starts on August 8, 2013 12AM EST and ends on August 21, 2013 12AM EST. i would love the shirt. I like the tshirt and a wall art. The "Twinkle Toes Personalized Wall Art" would be perfect. Thanks! If I win I would love the shirt for my son and water bottle for my daughter. If I win, I would like tshirt for my daughter. Those are very nice personalized stuff, the water bottle is really nice. Personalized stuff always attracts me. These are cute! I like personalized things for kids. What a neat surprise! Weee I won! Thank you!